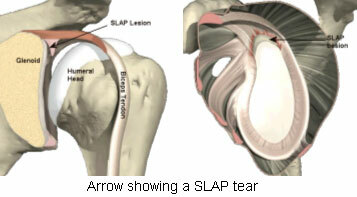 SLAP tears are an abbreviation for Superior Labrum Anterior Posterior. This signifies that the tear is in the superior labrum and runs in an anterior to posterior direction. This type of injury is common in tennis players, and other sports people but can also occur insidiously. The main issue with SLAP tears is that they can involve the biceps anchor. This is where the long head of the biceps attaches. The Biceps muscle attaches proximally via two attachments. The first is to the coracoid process, and is called the short head of biceps tendon. The long head attaches to the glenoid labrum. A fall causing compression to the glenohumeral joint. This occurs when the arm is abducted and forward flexed. This is the most common cause and results in a SLAP tear when the humeral head partially dislocates and detaches the labrum by shear and compression forces. Traction on the arm such as what occurs as you grab onto the rails of a ladder when you are falling can rupture the labrum via mechanisms directly impacting the labrum as well as the eccentric and sudden pull on the biceps tendon. Overhead athletes performing throwing actions, such as fast bowlers in cricket, tennis players and other throwing athletes. The other cause can be due to micro trauma from eccentric loading. This can occur due to improper muscle balances in the shoulder causing repetitive trauma over a long period of time. The usual complain in SLAP tears is a sudden loss of ability to perform activities overhead, along with pain during any of such activities. It can mimic a rotator cuff tear. On physical examination, there are some specific tests which can suggest a SLAP tear, but none of them occur in 100% of cases. Often an MRI scan is required. An MRI scan uses no radiation, and uses magnets instead to obtain an image of the shoulder. It is the preferred method for looking at static pictures of soft tissue structures. 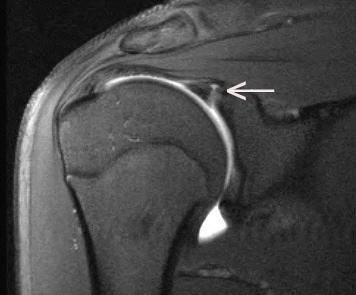 It can show a SLAP tear very well, especially when dye is injected into the joint, or newer MRI machines with more sensitivity are used. There are 5 main types of SLAP tears. The most common is a Type 2, where the labrum and biceps tendon are stripped from the glenoid. In some cases, non operative treatment is attempted. This is more common in throwing athletes as a SLAP tear can indicate other issues with the shoulder when it is not associated with a specific traumatic event. It can indicate that the capsule is tight posteriorly, or that the shoulder/scapula stabilisers are weak. A period of non operative management is useful in this subset. A lack of improvement at 3 months usually means that surgery is necessary. Dr Chien-Wen Liew performs all arthroscopic SLAP repairs. This means that the shoulder is instrumented using keyhole surgery. Depending on where the tear is, either 2, 3 or 4 portals are used. It is more important to ensure that the repair is solid, rather than restricting the number of portals. For more information, please contact Dr Chien-Wen Liew.